Eric Rendel is a British Orthodox Jew who lives and works in the UK and his book Light has recently been released in the UK, the USA and Australia. He works as a freelance IT consultant specialising in software packages for professionals and his first story was a children’s story which was published in the Jewish Chronicle in 1985 this was followed by another short story. The background to ‘Light’ is in Jewish mythology and the characters are mainly from within the Jewish world although the evil force is Eric’s own invention. The book has been written with everyone who likes fantasy horror in mind and for non-Jewish audiences he has explained the Jewish expressions that are used throughout the book. And God Said Let There Be LIGHT – And There Was LIGHT. But what was the LIGHT and what came before the LIGHT? Jake Tranton journeys through the seven Earths of Jewish mythology searching for the answers to this riddle and he discovers that before the creation of Heaven and Earth something else was created that should never have existed. Light is an intriguing novel that crosses genre boundaries, mixing as it does Kabbalistic mysteries with orthodox Jewish Theology, science fantasy, fantasy horror, adventure and Dan Brownesque mystery. It is a real assault on the reading senses, challenging us to understand and comprehend so many different scenarios and possible outcomes in every single chapter. Because it is based on Jewish mysticism, theology, myths and legends, it may not be easy reading for those who are not versed in those traditions. However, it makes up for this through it’s fast faced ‘good versus evil’ adventure, which everyone will be able to follow, even if they don’t understand the deeper meanings of why things happen. If you like mystical adventure type novels which transcend time and space then this will be one to pack in the suitcase for your next holiday. I’ve just had a review on Amazon that reads: “Gripping from start to finish, scared me to death in parts, reminds me of Dan Brown, brilliant writing. We wait with bated breath for the next novel.” Just love that I am being compared to Dan Brown. Gives me a massive boost to my confidence. It is no use just deciding that you want to be a writer. There are techniques to be used. It is important to hook the reader and wind him in with a good tug. These techniques can be learned. If you can’t find them for yourself get a good teacher. It depends on the story. Often ideas just appear from nowhere. In the case of ‘Light’ I had set out with the intention of writing a dark fantasy/horror novel from a Jewish perspective. I wanted a mythology that had not been done to death in literature. I wanted to create fantasy worlds that were not populated by elves, goblins and the like. To steer clear of the traditional sword and sorcery genre. I began researching Jewish folklore, and Kabbalah. There I found a rich mythology of which most modern Jews are completely unaware. Having found my sources I then selected bits that inspired the muse. Harry Potter and the Philosopher’s Stone. When it was written it was a unique idea that really caught the imagination. It would be marvellous if I could even gain a fraction of the success that book achieved. In the very first episode of Doctor Who the two school teachers Ian Chesterton and Barbara Wright force their way into the Tardis and we discover for the first time that a thing that looks like a police box is not only bigger on the inside than the outside but is able to travel through time and space. A classic piece of television that to my mind has never been bettered. There are too many to mention. So I won’t. The thing to do would be to take some power tools – a circular saw in particular – and chop the body up into little pieces. Then wrap them up in a tarpaulin and drive around the country burying a different piece in a different location. If you are able to travel abroad take a few pieces with you and deal with them in other countries. Come to think of it I might use this in one of my stories!!!! Where can I find out more about Eric and his book? You can also meet him on Facebook at www.facebook.com/ericrendelauthor and on Twitter. Thank you Linda. The interview was interesting and I enjoyed reading the review. Hope this generates some good responses. sounds like a good read. I think that one thing we overlook is that in a children’s or young adult book the “story” is concentrated with fewer diversions. When I read aloud to my kids, which we did until they were teens, the thrill of having them enthralled in a good story was golden. I love reading aloud, it always makes a difference to the way I understand the story and it’s also the writer’s friend as it helps you identify grammatical errors too. Have a wonderful 2015 yourself Bill and I’m still looking forward to your book coming out. I completely agree with you. I read to my son throughout his childhood and he loved hearing me re-enact the stories. 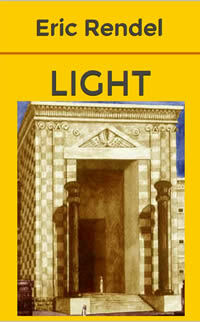 In fact the print edition of ‘Light’ is dedicated to my son Leon who is now old enough to read it for himself. It is not something I would allow a child to read though. Some of the content is definitely X rated. Please don’t forget to give me a review on Amazon if you read and enjoy it. Thank you.